Mr Kgalema Petrus Motlanthe was born to a working class family on 19 July 1949 in Alexandra Township, Johannesburg. He was elected by Parliament on 25 September 2008 as President of the Republic of South Africa. He served until 9 May 2009. 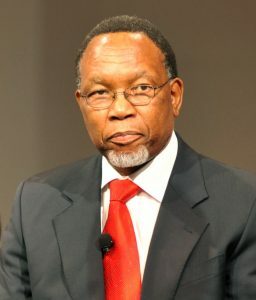 After his retirement as President, Mr Motlanthe was appointed by President Jacob Zuma to serve as the Deputy President. He served in that position from 11 May 2009 until 24 May 2014. In the 1970s, while working for the Johannesburg City Council, he was recruited into UMkhonto we Sizwe (MK), the then armed wing of the ANC. He was part of a unit tasked with recruiting members for military training outside the country. On 14 April 1976 Mr Motlanthe was arrested with others for furthering the aims of the ANC and was kept in detention for 11 months at John Vorster Square in central Johannesburg. In 1977 he was found guilty on three charges under Terrorism Act and sentenced to an effective 10 years imprisonment on Robben Island. After his release in 1987, Mr Motlanthe was tasked with strengthening the trade union movement in the country. To this end, he worked for the National Union of Mineworkers (NUM) as a national coordinator responsible for education. Among other things, he was involved in training workers to form shop-steward committees. In 1990 when the banning on the ANC and other political organisations was lifted, Mr Motlanthe was tasked with re-establishing ANC structures in the Gauteng Province. In 1992 he was elected General Secretary of NUM, succeeding Mr Cyril Ramaphosa who had been elected Secretary General of the ANC. Mr Motlanthe also served two five year terms as Secretary General of the ANC from December 1997 to December 2007. Mr Motlanthe was the Deputy President of the African National Congress during the period December 2007 – December 2012. He now heads the Kgalema Motlanthe Foundation that was established when he left office of government.